Shure's SB902 lithium-ion battery serves as a replacement or spare battery for the GLXD1 and GLXD2 wireless transmitters. The battery provides up to 16 hours of continuous operation when fully charged, and its 3-hour charging time allows you to charge a spare battery with plenty of time before the current battery runs out. Warranty: 2 years. 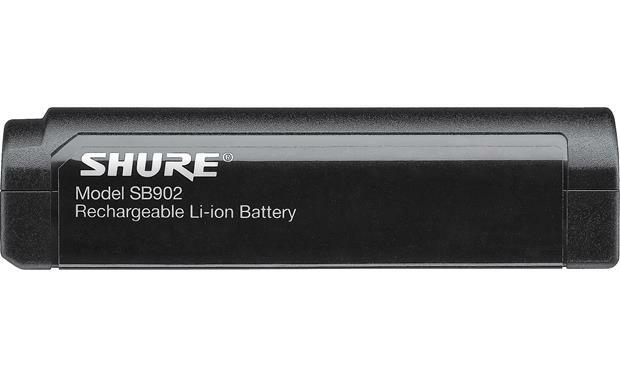 Overview: The Shure SB902 is a 3.7 volt, rechargeable, lithium-ion battery designed as a replacement or spare battery for Shure GLX-D wireless microphone systems such as GLXD24/SM58 and GLXD14/PGA31. Dimensions: Length - 2.88", Width - 0.75", Depth - 0.75"
Searches related to the Shure SB902 Rechargeable lithium-ion battery for Shure GLXD1/GLXD2 transmitters.